Maintaining balance during locomotion is a complex task with requirements and constraints that change during the gait cycle. To understand the control actions employed by the central nervous system (CNS) to achieve this, we induce artificial fall sensations and observe how the motor system responds. We prefer sensory perturbations to induce fall sensations rather than mechanical perturbations to induce real falls, because in the latter case it is hard to distinguish between purely mechanical, passive effects of the perturbation on the body and active responses from control action taken by the CNS. One method of inducing fall sensations is Galvanic Vestibular Stimulation (GVS). A very light electric current is applied between two electrodes on the mastoid processes behind the ears. The current depolarizes the vestibular nerve in a similar way as when the vestibular system detects movement. Another method of inducing fall sensations is to perturb a visual scene projected onto a screen covering a large portion of the subject’s visual field. The optical flow generated by movement of this visual scene relative to the head is then indistinguishable from optical flow generated by movement of the head relative to the scene during an actual fall. One prominent mechanism of balance control is “stepping in the direction of the fall.” When a person falls to the right, they can shift their foot placement to the right to move their base of support (BoS) for the following step back under their center of mass (CoM). In contrast to quiet stance, this step response is effective, because steps are taken regularly regardless of fall sensations. 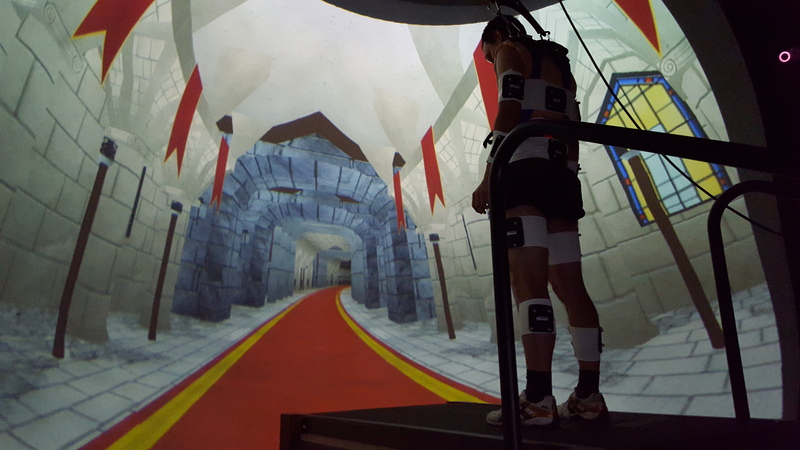 By inducing artificial fall sensations, we were able to show that humans make regular use of this mechanism in response to fall sensations. A lesser known mechanism of maintaining balance during walking is the “lateral ankle strategy”. During single stance, a torque at the stance leg ankle can be used to accelerate the CoM against a perceived fall, essentially pulling with their leg muscles against the fall. This response is limited in magnitude, because excessive torque will result in the foot rolling over, further destabilizing the system. But it in contrast to the step response, which is usually delayed until the next foot placement in the normal walking pattern, the ankle strategy has no time limitation. We have shown that in response to fall sensations induced by GVS, a systematic change of the ankle torque occurs as fast as 150ms after the stimulus starts. We are currently conducting multiple studies to further investigate the details of these two balance mechanisms. We hope to understand the biomechanical basis of how the foot placement response is generated by the interaction of different joint angles in both legs. We are also investigating other possible balance responses like hip torques.